Your carpet represents a significant investment in your home and it is not something that is easy to replace. You have to clean and remove all the furniture just to replace it. So, unless you have tons of time on your hands or you are moving out, replacing carpets is not a pleasant experience. So, taking care of your carpet is a good way to protect your investment. Here are 4 Important Reasons for hiring a Professional Carpet Cleaner in Birmingham, AL to take care of your carpet investment. 1. Appearance – This is probably the most obvious reason to have your carpet cleaned. The appearance of your carpet is what you see every day, so if you have stains or traffic lanes, it is going to be very evident. You may be able to spot clean some stains and spills, but as time goes on, you may develop gray or black areas from just plain walking traffic. Hiring a professional like Heaven’s Best Carpet Cleaning is one of the easiest ways to remove all the stains and brighten up your carpets. They will look much better immediately and they will dry in 1 hour! 2. Indoor Air Quality – The quality of indoor air is a major issue today for many people who suffer from allergies and asthma. Carpet is helpful to have because it acts as a filter and keeps a lot of the dirt and dust from recirculating into the air. But, regular vacuuming is important for removing the dirt and dust from the carpet. And, regular carpet cleaning by a professional firm like Heaven’s Best Carpet Cleaning will help rid the carpet of dust, allergens and other particulates. Heaven’s Best also uses cleaning solutions that are safe for kids, pets and elderly. 3. Investment – If you chose carpet and had it installed, you know how much it cost and that it is a major investment. If you purchased your home with the carpet already installed, you may have made a decision to keep the carpet or to replace it. Either way, the carpeting in your home is a major investment. You can protect your investment and help it last longer by regular vacuuming and yearly professional carpet cleanings. 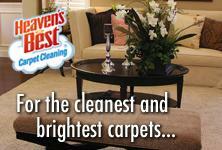 Heaven’s Best can keep your carpets looking great for years if you clean them once or twice a year. And, you will also extend the useful life of your carpet. These are 4 important Reasons to hire a Professional Carpet Cleaner in Birmingham, AL. Don’t wait any longer! Call Heaven’s Best Carpet Cleaning today at (205) 618-9150 to have your carpet professionally cleaned.